I've just got back my old daily driver from Berlin when I lived there in the '80s, my '57 Zuendapp Bella R201 scooter. A buddy of mine in Ohio who's pretty much the North American expert in the breed was kind enough to give her the once over after her too long quarter century of hibernation in one shed or another. Thanks to him she's running like stink again. The hope is that maybe the wife will take a liking to her. You see, even though she's only a 198cc 2-stroke, once she winds up there the Bella cruises quite happily all day long at about 50-55 mph, which would make her a good touring match for my 2005 Bullet 500ES "Military", who also rolls along happiest at such speeds. Optically it may come off a little bit "Don Quixote and Sancho Panza," but functionally they should be a very fine match indeed. That's one beautiful scooter! It's sweet to see these artful bikes getting some love. My first freeway-capable bike was a Zundapp 250 Super Saber. I miss that oily aroma. I actually had no real problems getting a title for it in Virginia back in the late '80s, armed as I was with a special German import title in like 87 languages with its fancy matching oval plate and a folder about the size of Napoleon's Tomb from the previous owner containing every scrap of documentation, factory scripts and pap smear results going back to the Eisenhower Administration. Getting it insured was weird...GEICO wanted me to bring it by their offices for a looksee. But I suspect they may just have been curious. Since I'm at least on record with them now, I don't expect I'll need to be doing that again. State inspection was basically, "Dude, just help yourself to the stickers whenever you need one." Not that I'll be needing to do even that. Henceforth, I'll just be going the Antique plate route. I have to tell you, a Bella's not like all those other "twitchy" handling scooters. If you're happy thumping along on an old "iron belly" 500 or 350, you'll soon be right at home on a Bella. Handles like a real motorcycle, it does. In fact, what with its Earles cantilever-type forks and big cast wheels, it handles better than many. It also has a right-handed seesaw shifter that you can even use in pumps with 6 inch heels (a good look for me that I can pull off without looking "trashy"). It's a real joy to ride. Hell it took me on vacations from Berlin to Italy through Commies, over the Alps, and back...twice. If I ever slap together a little regional gathering of Enfield owners hereabouts, an idea I'm toying with, you folks'll have to have a go with her down Bristow Road. You'll soon want one yourself. A nice relaxed old 2-stroke's a fine thing indeed. I think those scooters are rarer than hens lips here in the US. I did a Google search for 57 Zuendapp Bella R201 scooter for sale" and got 91,000 hits world wide. 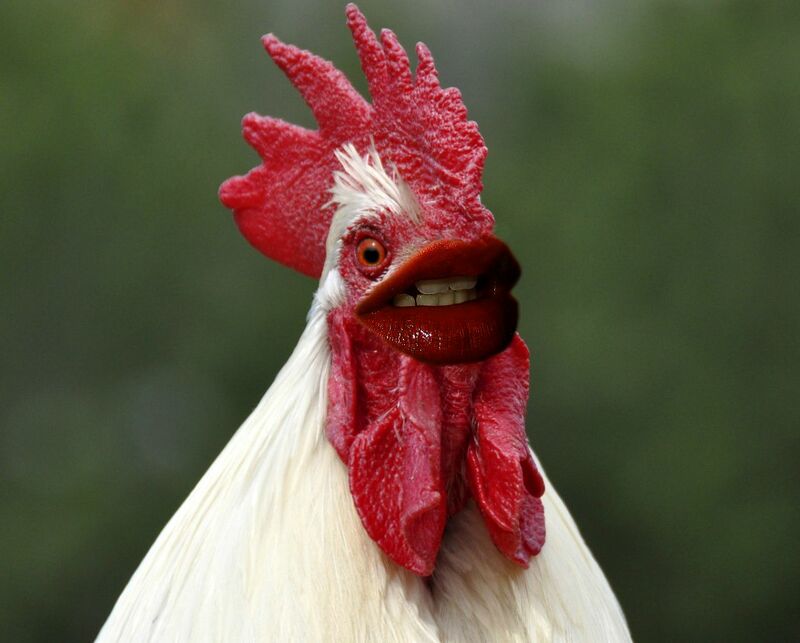 A search for "hens lips for sale" got 5,790,000 world wide hits. Here's a promising Bella in Stockton, California. For some reason I can't quote your original post so I'll do this one. Back when I was a very young, fatherless whippersnapper (I was 11 in 1949) along with being raised by a M/C of ex- and active military guys I was madly mailing away every month for EVERY brochure in every Pop Mech and Mech Illustrated for ANthing that had an engine and two wheels. Along with the harleys that were in my yard every day I was constantly perusing and analyzing brochures that came in the mail of every kind of two-wheeled thing that was out there all through the '50s. The exploded and cutaway drawings of those days were fascinating to me and I would spend hours staring at these pictures trying to figure out what was what. I spent hours looking at the Zundapp Bella brochures. I can still remember how much cooler I thought they were than the ubiquitous Vespa and it had a bigger engine IIRC. One of Oasis' LP albums has a Bella on the cover. It belonged to one of the band members. So along with being imprinted on harleys at 11 like one of Konrad Lorenz' geese I also had a very strong impression of all the European bikes; bikes nobody ever heard of now. This is azackly why I finally ended up owning an '08 Enfield in 2010 at 72 y.o.. I became totally obsessed with owning one after seeing my best friend's girlfriend on a brand new 2004. It looked azactly like those bikes I stared at for years in the brochures in the early '50s. I didn't believe either one of them when they told me it was brand new. Anyway. I have the OEM taillight assy. and directionals if you want them. Thanks for your very kind offer! In desperation I was already sizing up Harbor Freight trailer lighting gear to maybe lash on provisionally with silly straws. I'll shoot you an email or PM via the Forum in the morning. Indeed! Procure the finest box in all the land, and have them bring it to my bedchamber! Procured box($3.50 ). You can no longer find boxes in the usual places we found them "back in the day"*. Box on the way a couple hours ago. I'll give you the tracking # if you want it. Thanks, but it'll get here when it gets here, and that's soon enough for me. I really appreciate all the trouble you've gone to. I just realized sometime yesterday afternoon that I forgot to put the damn bolt in the box; the bolt that comes from behind, thru the fender and threads into the light housing. It's just the right length and threads. Let me know if you don't find something that works and I can mail it to you for practically nothing in one of those puffy enva lopes. I don't find it in my parts book.